Amersham Imager 600 is a sensitive and robust chemiluminescence imager for high-resolution digital imaging of protein and DNA samples in gels and membranes. Amersham Imager 600 is equipped for chemiluminescence imaging and includes an automatic overlay function, which allows simultaneous imaging of a chemiluminescent sample and a colored molecular weight marker. Amersham Imager 600 series is equipped with a dark sample cabinet, a camera system, filter wheel, light sources, and a built-in computer with control and analysis software. High resolution and precise quantitation of low signals are achieved using a multipurpose 16-bit, 3.2 megapixel super-honeycomb CCD camera fitted with a large aperture f/0.85 FUJINON™ lens. Rapid cooling of the detector makes the imager ready-to-use in less than 5 minutes. 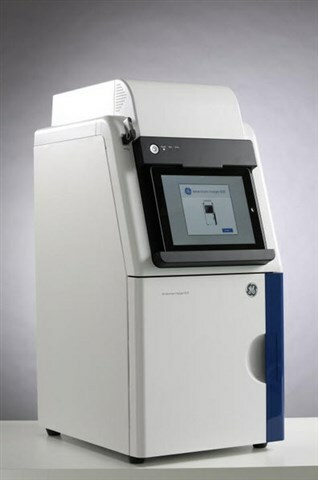 Amersham Imager 600 series is backed by GE Healthcare’s expertise in Western blotting and electrophoresis applications, and can grow with your imaging needs. The system comes in four fully upgradable configurations based on equipped combinations of light sources and filters. All systems can be used for chemiluminescent detection and non-quantitative gel documentation. Intuitive operation: You can operate the instrument from a tablet computer with easy-to-use image analysis software. No prior imager experience or training is required to obtain high-quality results. Excellent performance: Advanced optics provides high-resolution images, high sensitivity, and broad dynamic range. Robustness: An optimal instrument for multi-user labs. There are no threads in GE Healthcare Amersham Imager 600 Series Reviews at this time.